Lyn revealing to Sindi she knows what she and Rocco were talking about. Rocco talking Sindi out of exotic dancing. Sindi insists she doesn't love Rocco. Rocco keeps trying until Sindi gets up and leaves. Max brings in some snacks for a movie he and Boyd are about to watch, while Izzy and Summer are out. He complains about Boyd picking an R-rated movie to watch. Max tells him to put on one that Summer picked out. Boyd mentions Gus, and how he was a fruit-loop. Max tries to justify his behaviour (he was lonely and wanted to fit in). Boyd comments on Gus wearing Max's clothes, and how Max let him. This is the first time Max knew anything about it. Suddenly they hear noises on the roof, but Max figures it's just a possum. Boy is lying on the couch eating breakfast and watching TV, half asleep. Max tells him to get a move on and clean up the lounge room, and Boyd tells him he couldn't sleep, the possum kept him up. Lyn, Oscar and Tom are eating a meal. Susan enters, but tries to leave when she notices Tom. However, Lyn calls her in and introduces them to each other. Fortunately for Susan, Tom pretends it's the first time they have met, and Susan plays along. Scott and Sindi come in and Lyn introduces them to Father Tom. Scott is confused about his title of “Father” (“How many kids have you got?”) and calls him “Rev”. Sindi tells Lyn Making Mansions will be on that night. Lyn is short with Sindi and leaves the first chance she gets. Susan assures Sindi that Lyn will be pleased with the show. Scott wants a salad for breakfast. Sindi starts to object, but Susan tells her to be grateful – it's not fish fingers. Boyd and Max arrive to a very clean lounge room. Max thinks Boyd did it, impressed that Boyd did a thorough job when he asked him to clean up. Boyd pretends he did clean and vacuum the room, but is puzzled. Lyn calls one of Joe's clients about an outstanding account. Jack checks the fridge and says “God, are we out of OJ already?”, in front of Father Tom, he then stirs him up more by calling him “Father” instead of “Uncle Tom”. Sindi arrives with a bouquet of flowers, but Lyn is still distant with her, and tells her she wants the premiere to be family only. After an awkward conversation, Sindi leaves. Sindi returns and says that Lyn hates her. She regrets ever making the show. Scott points out some job vacancies in the paper – jobs that Sindi has no experience for, like public relations and zoo-keeping. 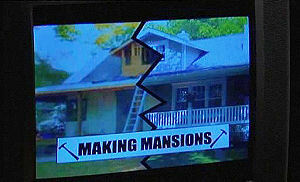 After Sindi and Scott leave the room, Lyn comes to invite Susan to watch Making Mansions. Susan declines upon realising Tom will be there, and tells Lyn she promised Sindi she'd stay home and watch it with her. Susan tells her she's not taking sides, but Lyn doesn't seem convinced, and leaves. Lou, Max and Boyd have joined the Scully's to watch the show. They joke about how Jack might get discovered and become a model. Susan, Sindi and Scott sit down and wait for the show to start. Scott announces that he thinks he should have his own cooking show, to Susan and Sindi's amusement. Lou and Tom are talking in the kitchen but come into the lounge room when the show starts. Sindi (on TV): Our mission was to find the typical suburban Australian street. We found it. And within that street, the typical suburban Australian home. But go inside and ask yourself, did we find the great Australian dream, or a total nightmare? SINDI: This isn't my edit! SUSAN: Maybe they just changed the beginning bit. SINDI: Now let's meet the family. CAPTION: Lyn Scully, 46. Mother. Housewife or fishwife? On the verge of a nervous breakdown… Jack, flexing and checking himself out in a mirror. SINDI: This is not it! This is not my show! TV CAPTION: Jack Scully, 20. Failed soccer star. HIMBO. 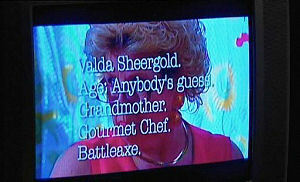 CAPTION: Valda Sheergold. Age: Anybody's guess. Grandmother. Gourmet Chef. Battleaxe. LOU: It's a bit different, isn't it? MAX: What was she thinking? TV CAPTION: Sindi Watts, 30. Wannabe Presenter. BIMBO. SINDI: Thirty? Are they insane? TV: Lyn is showing Sindi around the old kitchen. LYN: The cupboards are functionable. Plenty of room for the Tupperware. I guess that the décor could be a bit updated. LYN: Would somebody get Oscar's bottle out of the fridge and warm it up, PLEASE! SINDI: The Scully's are clearly in need of a makeover, and I think they'd agree, they're lucky to have me. Jack, carrying his weights, accidentally knocks over something up the back. Jack (to Sindi behind the camera): Oh, you're here early, I'm not ready. SINDI: Oh, that's fine, you look fine. JACK: Yeah, but my muscles aren't buffed. Valda getting up from her sewing machine, but is stuck to it. Scott (behind camera): Excellent, you sewed yourself! SINDI: Next week, we're off on location, giving you the chance to see Valda Sheergold the homemaker, as Valda Sheergold, chef extraordinaire. Yes, we're going to be visiting her celebrity cooking classes. VALDA: Sindi, I think not. Valda coming in through the front door: Here we are. This will make your Ricky Martin poster look good. JACK: I do not have a Ricky Martin poster! VALDA: Come on Jack, we live in modern times. SINDI: Another day of Scully family mayhem, as Jack tries to rebuild an entire picture frame. [Camera starts to zoom in on Sindi's chest] It's been a bumpy ride so far, and – Scott, what are you doing with that camera? Scott, show me what you're filming! SCOTT: I'm just getting some close-ups. The phone rings. It's Valda. Sindi is now hyperventilating. “Lyn is going to kill me!” Susan tries to calm her. Lyn tells Tom that they aren't really like that. Max tries to be supportive. Lou suggests a word with their lawyer. Jack shushes everyone when he comes back on TV. TV: An argument about Jack painting the kitchen the wrong colour. Valda steps in the pain and makes footprints all over the floor. The show ends with Sindi asking to tune in next week with more renovations tips with the most dysfunctional Australian family. Everyone is speechless. Lyn breaks the silence with a single word: “Sindi”. Sindi is packing her bags. Susan tries to talk her out of leaving. Scott is still laughing. There is a knock at the door. Sindi is terrified at who it is: Jack and Lyn. A huge argument breaks out. Sindi is hysterical and tries to convince them it wasn't her edit. Tom comes in and calms everyone down a little. He advises that everyone goes home and talk it through in the morning. Sindi suddenly realises who is to blame. Sindi confronts Rocco about the episode. Rocco denies any involvement and tells her he would only find out what happened if they were together. 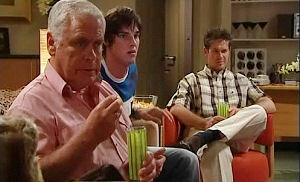 Rocco tells her that “Rebecchi's not coming back – ever”. When Sindi asks how he knows that, he leaves. Scott comes around from behind the building, having heard the conversation. Lyn wonders if Tom finds her new “Fishwife” label to be accurate. Tom assures her he doesn't. The phone rings. It's Susan, asking her to come over. Susan apologises for not coming over the night before. She explains her past encounter with Tom and how she tried to pick him up (“whose brilliant idea was it that they didn't have to wear that collar thing all the time?”). When Lyn asks what he said, Susan tells him they're going out Saturday night, which Lyn believes at first. At the end of Susan's story, Lyn can't help but laugh at the stupidity of it all. Scott tells Susan about Sindi's meeting with Rocco on their way to class. Susan discovers Tom volunteering for an Amnesty International thing happening at school.